It bit complicated to alter or repair you own fan since it is bit dangerous you will do the wrong way it will cost short circuit . Anyway its good to note that every ceiling company doesnt bother to add it off to there products but your articles are really detailed I will present this one to some students taking up repair am pretty much sure they would get something with it. 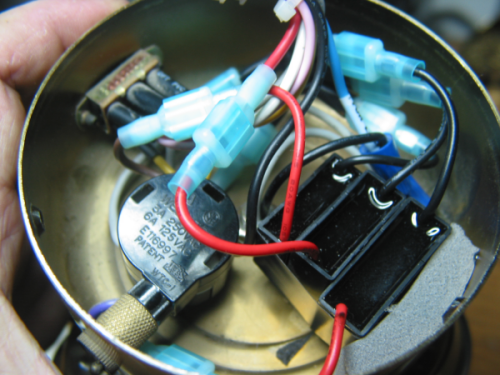 “This posting details knowledge I’ve gained in the process of successfully replacing ceiling fan capacitors that had blown, but additionally, understanding of how to alter the fan blade’s revolutions per minute (RPM).” – Fantastic. Only when we get a problem and we try to find a solution we get lot of information related to it. What a Great informative Story! The Light kit below the fan says Airflow by Casablanca. My house was built in 1994. Builder installed these fans. The Pull Chain broke and the fan was on all day. I turned off the circuit breaker and removed the old switch. It had 3 wires going into it: PINK, YELLOW and GRAY. I do not remember where these wires went into the Switch. My Switch has L, 1, 2, and 3 written on the face. It is a JIN YOU Switch. Do you have any experience in this model Fan? If so can you tell me the original configuration of the colored wires to the L,1,2,3? I contacted Casablanca and the only records they show for a 3 switch has Green, Brown, Black and Grey going into the Speed Switch L, 1, 2 and 3 respectfully. I spoke with some other repair guys and they told me that if my switch has L,1,2, and 3 that there should be four wires attached to it. But I double checked and I only removed 3. Pink, Grey and Yellow? Any Help or other resources would be greatly appreciated. “Do you have any experience in this model Fan? 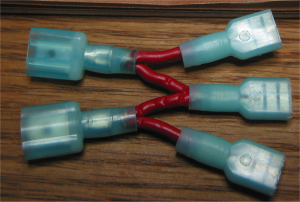 If so can you tell me the original configuration of the colored wires to the L,1,2,3? No, and no. I wouldn’t want to speculate. Sorry I can’t be of more help. It sure would be handy to have the schematic, wouldn’t it? The colors of the wires needs to be noted before disassembly. One way to do this is to take pictures. Another way is to write it down, any colors and where those wires go, in your particular fan, similar to how I showed above with my fan here and here. Link to return to article. The only other way that I’m aware of to figure the puzzle out is to backtrace the colored wires to their components, this presumes you have an accurate wiring diagram and know how to read it, upon which the proper connection point should then become obvious. In the absence of a wiring diagram or schematic, then one can be drawn by backtracing all the wires to all their components. This is quite time consuming, but I’d guess it can be done. The repairfaq.org link in my prior post claimed that manufacturers are under no obligations to keep a standardized color coding for their internal wiring, that they pretty much use what wire they have on hand. I don’t know if it was an accurate statement, or not. They have additional suggestions for what to do when you’re not sure what wire goes where, and I’d guess their method would work, I used a variation of it myself years ago with the forgotten switch replacement described above. In any case, it’s important to always note where wires go BEFORE disassembly and record that information, then you can refer to that record during reassembly. Good luck, and don’t forget the disclaimer! speed control. Not sure exactly what kind of motor it is. board is not an option. Any ideas or suggestions finding replacement ceiling fan 4-speed on/off chain pull switch. Chain fob has name Galleria on it. The chain broke just as it enters the body of the switch. The round, 5-wire switch has the name ‘JIN YOU’ along with; 3A 250VAC, 6A 125VAC, and PB108 and E70469, Taiwan. Any help,or suggestions will be appreciated. Leonard, I believe that you have at least two choices, one is to replace the switch (if you can find a replacement), the other is to (possibly) repair the broken chain pull by disassembling the switch and installing a longer replacement chain. I’ve repaired broken chains in 3-speed switches more than once, however, they (sometimes) seem to break when the switch is getting harder to pull due to some type of age and/or wear within the switch, so replacement of the whole switch w/chain is probably preferred (depending upon availability). My prior post titled “Ceiling Fan Capacitor Woes” lists several suppliers of those capacitors, included in that list is the supplier I purchased the new ones pictured above. I have no business relationships with any of the suppliers, I simply used a public search engine to find them. I have a 52″ Cieling Fan in my living room, and all the wires accidently got disconnected from each other. And I do mean al the wires. I have 9 different colors of wires and I have no idea where they get they go, to the switch – forward and backwards motion, (I did have it working on reverse on all three speeds but when I switched over to go forward it would blow thee circuit breaker everytime. I have been working on this all day and can bot seem to get aby where with it, And I do NEED My ceiling fan operating! Veronica, I hope this is humorous: With all the broken wires, it’s now a PUZZLE(!) and subject to my time wasting disclaimer! My first instinct with things like this is to get a schematic. The schematic used in the above post may or may not match your fan’s wiring, but if your fan is similar to mine, then Be Aware that schematic has an idealized or simplified reverse switch. It’s logistically accurate but doesn’t show all the wires or the switch’s terminals used to achieve that logic! My ceiling fans’ reverse switches of six terminals each are known as a ‘double-pole, double-throw’ or DPDT switches. They are commonly used for polarity (DC) or phase (AC) reversal. – Motor Reversing DPDT switch wiring that appears here. – Sherline has published directions for reversing the motor direction on some of their machines, and it includes a nice image of a DPDT switch in a similar motor-reversal scheme. – Wiring for DPDT reversing switch appears on The Electronic’s Club page. – The next image URL —> hzzp://www.1728.com/dpdt.gif <— (it’s not a live link due to request of site owner, sorry, just copy and paste it manually into your browser and change the “zz” to “tt”) That image appears on a Basic Electricity tutorial page (you’ll need to scroll around a bit to find it). Quick link to return to article. If you find the puzzle becoming too frustrating or time consuming, you could decide to buy another fan, but it reads like you made some significant progress with your unexpected(!) repairs, though the puzzle(!) is not yet fully completed. It helps to write down what you do, the successes and the mistakes, sometimes a pattern emerges, or sometimes just eliminating what doesn’t work helps. The error is in you formulas for the equivalent capacitance. I have shown corrected formulas andsome results below. You were trying to make this more complicated than it is. I uses 4uF,6.5uF and 6.5uF respectively for the values to show difference in the 2 formulas. Put these in your spreadsheet and give it a try. You can see for each speed decrease the capacitance decreases. This also changes all your graphs. 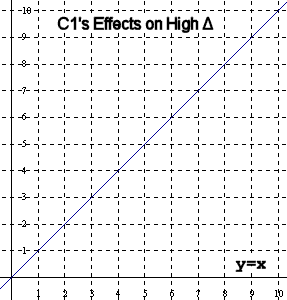 As C1 increases all speed increase. 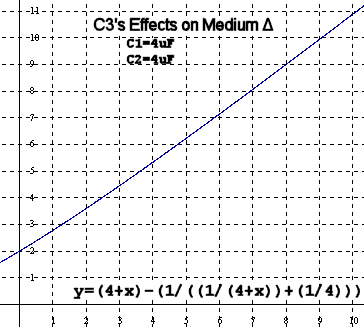 As C2 increases only the medium speed will increase. 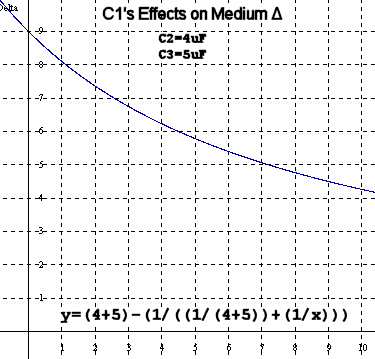 As C3 increase both the medium and low speed increase. I happened to trip into your blog site, reading your project diary. You are lucky not to get hurt for the wrong cause. Refrain from mimicking from ‘blogs’ and ‘google-searches’. DO NOT follow the above plan. as i see L was orange and 3 was black the yellow and purple was hangin out of 1,2 so that was just a diagram for black on 3 and orange on L. unfornally i have another ceiling light in other room i am goin to take that off and take a look for proper wire diagram for this switch that came off to put it back in, i super glue the plastic that broke off and reinstall it. Hi Rick! Thanks for thinking about it and offering an alternative! I’m sorry it took me so long to get back to you, I was preoccupied with another maintenance project for a couple of months, and couldn’t spare the time to sit down and think or meditate about your formulas. You’re probably long gone due to the time lapse in answering you, but just in case you happen to drop by again…. Sure, but just looking at your chosen capacitor values my question would be whether those values resulted in a medium speed that actually is faster than HI when measured at the fan? Going from memory, as this project was completed some time back, I wondered for awhile whether F(c1) = 2C1, it seemed approximately correct when I was testing against fan speeds visually, then I discarded that idea when some issue, that I no longer recall the specifics of, presented itself. 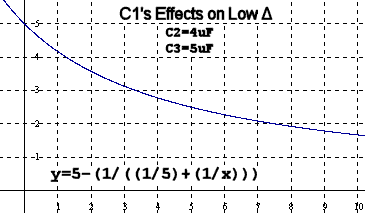 In your formula, “Low 2.48 = 1/((1/C3)+(1/C1))”, you appear to be ignoring the difference (what I termed delta), and any effect of the Aux coil. You are using part of the same formula that I used for the “leg of the circuit that goes to the Run coil” without also accounting for the energy’s effect on the Aux coil, which my differencing tried to account for. In your formula, “Med 3.06 = 1/((1/(C2+C3))+(1/C1))”, it appears you’ve used the same pattern as with the low, once again ignoring the effect of energy on the Aux coil. What I don’t understand about your formula implementation is that with Hi speed, what I conceived as a difference or delta seems to result in C1, the same answer you came up with. I see the Aux coil gets energy (or whatever it’s correctly referred to as) without the influence of a capacitor, while the Run coil gets energy after it “goes through” C1. 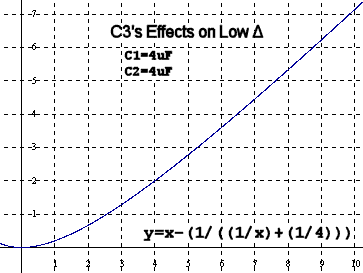 Therefore, the difference of the two coils (that act on the rotor) is simply C1 (or possibly the absolute value of -C1). 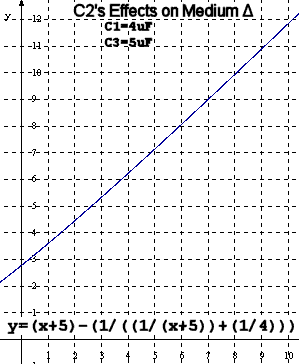 Since your formula for HI seems identical to mine, it’s not clear whether you conceptually differenced the Aux coil and the Run coil, or did not. The pattern you’ve used for the formulas for both LOW and MED seems to ignore any effect of energy on the Aux coil, whereas all of mine attempted to account for an effect on the Aux coil. Why are your formulas solely concerned with the Run coil(? ), or alternatively, why are your formulas ignoring the energized AUX coil? Rick, now I see why. I was never happy with the formula for HI speed for the reasons explained in the original post (and the fact I derived it, in part, intuitively, which I mistrust), however, your formulas for medium and low speeds seem to follow the same logic. It does make more sense that all the formulas follow the same logic, as that probably eliminates the need to calculate a percentage change for each speed. I’m unlikely to make any changes to the main post, though I probably should add a link to your post at some point early in the math portion, to advise others there’s another way to conceive of this. Thanks for taking the time to investigate and comment. Changing blade pitch or angle changes the blade or shaft RPM, so what do you mean by “original speed”? It appears to me the capacitors alter the apparent power output of this particular motor’s winding design. This RPM change is testable. It is repeatable. It also appears to be calculable. When I write “power output” I’m using the phrase loosely in an English sense, not strictly as a specialist may understand the term. A better loose term may be torque, though I’ve never seen that applied to commonly marketed and retail-level electric motor specifications, HP or horse power seems more commonly used on the size of most electric motors I’ve looked for in the past. The blade-pitch/RPM-change is easy to test on the low speed setting as it can be visually tracked by the eye and timed with a stopwatch. It seems this would also be true if the existing blades are shortened, but this is not as easy to test, as it makes a permanent change to the existing blades’ dimensions and surface area, and could become rather expensive if shortening them did not result in the desired outcome, to say nothing of refinishing expenses and time. I’d rather have longer blades moving slower, as this should decrease the turbulence created by our existing fans’ blade design. Flattening the blade angle such as you’ve explicitly suggested, will increase RPM, and possibly increase associated turbulence of our existing blades, though flattening the pitch would seem to offset turbulence potential to some degree. There’s also a deeper level of “speed” that relates to volume of air movement with each single revolution of the fan’s blades on each respective switch position. As blade pitch is changed to to a smaller angle relative to the plane the blades rotate upon (which would seem to move less air with each single revolution), the fan blades’ RPM appear to speed up, suggesting that RPM or pitch (when each is considered singly) is not the only factor relative to the amount of air in the room moved. Reducing the pitch angle seems somewhat similar to shortening the length of the blades (and keeping blades’ pitch constant). Increasing the pitch angles, or presumably lengthening the blades, slows the apparent RPM, but would seem to move more air with each single revolution, at least up to some pitch angle, perhaps 45 degrees (just a guess) (Upon further reflection, moving it past 45, fully to 90 degrees, then the blade would be centrifugally pushing air away from the fan horizontally, and the ability to reverse the air movement would be lost, as either motor direction would push the air the same way). Back to shallow blade pitches: Turbulence would likely be an additional factor to consider, particularly at higher RPMs, so I’m guessing there’s some mathematical non-linearity herein. Certainly, the blade tips are moving faster through the air than the portions of the blades closer to the motor’s shaft (circumference) at any given RPM. In addition to changing the pitch of the blades, one could also bend the end of the blades downwards toward the floor some small amount, and a leverage factor may come into play with regards to RPM. For a visualization, imagine a conic shape (versus a flat pancake) with the point of the cone at the ceiling. As the fan blade tips are increasingly moved toward the floor, each an equal amount, the diameter of a horizontal “pancake” slice decreases (“slice” intersects with all equally moved blade tips); another way of phrasing this is the radius (blade tips to the center of rotation) decreases as tips are pulled downward. However, in this case, the surface area of the blade would not change. So, flow of air in the room can probably be focused or flowed somewhat differently by changing various geometries of the fan’s blades. To greater or lesser degrees and for various reasons, it seems these would also change the visually-apparent RPM of the blades, with one adjustment possibly having a tendency to cancel the other with respect to the total volume of air moved over some fixed time period. While there are many different ceiling fan designs, often incorporating different blade designs, some no doubt quite high-tech and perhaps a minority of them with low-turbulence design, the fans for the masses such as I could afford were outfitted with simplistic straight blades apparently made of thin plywood. Further, these seem to be the only replacement-blade design available at any cost at mass-market outlets that I’ve seen. Retrofitting a low turbulence blade design is probably not cost effective, as it would probably require special machining of the part they attach to (or custom manufacturing of that part) and which itself attaches to a part of the rotor, and all the associated refinishing that might be required so it looks nice. Additionally, even after the time and expense of retrofitting, the actual breeze created on the various manufacturer-set speeds would still likely need adjustment. So then one is left with purchasing some entirely new ceiling fan at some very high cost given the way manufacturer’s and retailer’s MBAs like to consider “value added” when they price their products (instead of pricing based upon cost of production + a reasonable profit). My primary objective was to repair the fans’ blown factory capacitors by replacing the capacitors, the secondary objective was to slightly alter fan speeds. The secondary objective came about in the process of looking for capacitors of exactly the same farad values the manufacturer used, which seemed unavailable at the time, and which required some slight value changes when considering the three-capacitors-in-one modules that did seem to be publicly available. The post I wrote above is a documentation of pursuing that secondary objective. The fuller “story” is partly available in the other post. My experience agrees with “possible to overheat the capacitor”: The factory-selected capacitors also evidently overheat and eventually blow with age, some sooner than others. I’d also guess the motor winding will eventually fail. When one of these capacitors blows (presumably due to age) depending of course upon the circuit that capacitor is wired to, it seems the fan’s remaining switch settings that may still operate seem to slow down RPM. This ‘blown capacitor circuit’ seems to manifest as a factory capacitor change of much greater than -1uF within that circuit on our fans, particularly as the capacitance values and the energy flow are logically indicated by the wires’ schematic representation both going to the capacitors and from them into each respective motor coil, Run and Aux, and are calculated by capacitance formulas. So, it would seem safe enough to slow the fan, as the one-or-two blown-capacitor fans most definitely continue to operate in their reduced-RPM state for extended-time periods without creating any readily apparent danger. This capacitance-value change also appears as the primary method used to create the three speeds themselves within the existing or fixed motor design as the speed switch changes the routing of energy that goes to the motor’s coils. “Speeds” in this last sentence’s context is possibly not the best word to use, I’m thinking that a better word could be apparent power output, because the coils are moving the shaft or armature that the blades are attached to and which provide some amount of physical resistance to movement, and presuming no other changes such as blade pitch, a shaft RPM increase indicates greater power output, though I’m probably using the term “power” in a non-electronic or loose sense. It didn’t occur to me to actually try speeding up the fan for the purposes of testing. I’m sure there’s some kind of safe limit somewhere thereabouts, and am guessing this limit also relates to the HZ frequency of the supplied AC power (and the motor winding design) as well as other specifications. This all gets into areas which were very far beyond my primary purpose of replacing a blown capacitor, and secondary one of slightly slowing air-movement volume for comfort. Calculating most of this is beyond my current level of understanding. It’s my understanding from online research that this design of electric motor, typically used for a ceiling fan, operates in an almost ‘stalled state of high slippage’, a paraphrase of something I read that is difficult for me to decipher. I presume the capacitors slightly shift the sine wave going to one set of coils versus the other set (Run and Aux). I further presume maximum power is found by shifting the waves going to each coil, run and aux, 90 degrees from each other; going farther than that, to 180 degrees, probably electrically locks the shaft and I can certainly conceive how that would create excess heat, however, the *physical position* of the windings to each other may already do some or all of this angular shifting. I can also conceive how increasing the power output, by increasing the speed the shaft wants to run at by increasing the phase shift going to the two coils, could increase heat. I further presume that at maximum power or torque (whatever phase shift is found to create maximum power) applied, RPM can probably/possibly be altered by changing the frequency of the electric AC powering it, possibly to some degree the voltage (a different mechanism presumably changing the strength of magnetic field), though for the purposes of a ceiling fan, that seems like awfully fancy and expensive circuitry for no reasonable purpose. All of this would undoubtedly alter the heat output due to various changing variables, including the load placed on the motor. In short, I have a lot of *unanswered questions* regarding the operation of this type of electric motor under various operating scenarios, many of which would likely never apply to its usage as a home ceiling fan. My guess is that these motors can be used for a lot of different purposes, but they would seem to require AC power, which limits their usefulness for DC operation, without a conversion of the power to sine (I wouldn’t choose square wave, though it might be useful for testing on a bench, presumably it would be noisy. I see an advantage to phase shifting with sine as it ramps gently up then back down, rather than with square’s abrupt change of polarity, and getting into conceptions of pulses). It could be revealing to hook them up to some DC batteries, and build a power supply that converts to AC and alters the phase shift going to the RUN versus the AUX coils, and which power supply additionally alters the frequency for the purposes of testing — just to play around, of course. I haven’t tested *any* of these ideas, beyond the observation that changing capacitor values of from 1-5uF (or was it 1-6uF) changes RPM. Hmm. I wonder whether the motor could be used as an AC generator? IF a ceiling fan can be used as an alternator, then optimum phase shift and other voltage and current specs can likely/probably be backwards derived by turning the shaft and generating power and analyzing it and its two-coil waveforms and their differences. This *backward engineering* would need to be done on a suitably-equipped electronics-bench, presumably including an oscilloscope. IF it won’t work as a generator, it might be possible to make a custom stator to force the issue, or some other trick like powering one set of coils while turning the shaft with another motor and measuring the changes in the other winding. I’d love to try it myself, but as one ages, priorities and goals change, and all of this takes a great deal of time, and for what purpose(?). So, I limited myself to capacitors sold as “ceiling fan capacitors”, from a company and retailer in the U.S. (same power supply specifications), and presume the sales literature was labeled correctly. No, or sort of no. In regards to temperature, and given that the capacitors are encased in what appears to be epoxy, and further that that material is likely a thermal insulator, measuring the capacitor’s plate temperature would seem a bit difficult. (Or are you making a physics reference with your use of “Temperature” such as conservation of energy or laws of thermodynamics? If so, I couldn’t possibly comment.) I suppose a temperature reading could be made upon the wire coming out of the epoxy, because that is a conductor, though there could be loss of heat or time delay of some kind. However, two of our repaired fans have been running continuously on low, one on medium or low, since the repair (need to check date of main post) for about more than 1 year, and feeling for heat at the top of the motor cases doesn’t suggest “heat”: The case feels “cold”, and when momentarily stopping the blades movement (leaving the switch in it’s run position) to stop the movement of air, there’s no readily felt convection of warm air rising from the case. I did not measure that, it didn’t occur to me after spending the far-too-much time I did trying to figure all the the stuff in the main post. I just wanted the fans fixed at that point of time consumption, and decided to publish what I learned so hopefully some others won’t have to spend quite as much time as I did to understand how using a generic ceiling fan capacitor that is generally available but of a slightly different value might change the fans operation after installation. Anyway, your thought of measuring is an interesting test idea, and I believe it would be easiest to perform with a ceiling fan on a bench and the meter set up to measure the power entering the fan, where it’s typically installed to the electrical junction box (house wiring). I’d guess the blades would need to be attached, and the “bench” would need to also simulate the airflow that occurs in it’s installed state. I never removed ours from the ceiling for the above described capacitor replacement, nor did I intend to. The house’s electric meter could possibly be utilized over some period of time to similar effect without removing the ceiling fan from the ceiling, but it didn’t occur to me, and has problems of its own such as the need to assess other points of electric consumption within the downstream electric distribution, particularly cyclic ones. I keep thinking about measuring it now. I guess it’s easy enough, the amperage is probably low enough that it wouldn’t blow a test meter, and it does seem, from looking at the wiring diagram, that an inline measurement can also be placed at the load terminal of the switch, or one of the other legs of the switch, something else that didn’t occur to me. It would be kind of nice to know, but there’s no “before” measurement to compare the readings against, except for documentation which could be wrong, so then I’d need to put original value capacitors back in the unit to make such a measurement. Seems like a lot of ado about much of nothing, and for what purpose? Perhaps the next time one of these capacitors blow, and I need to go into the fan’s case for another reason, I’ll remember to check this for curiosity’s sake. Here’s the basis for my energy statement in the original post, however, my fans’ documentation gives different figures, but the general trend seems the same, that faster speeds use more power, and here I’m using “speeds” as a reference to the phase angles the chosen capacitors create in the respective two windings (or in only one winding versus the other getting a non-shifted phase angle wave). It seems blade speed correlates with power consumption, though amperage change appears to have a shallower slope at low to med RPMs than med to high. Why bother with verifying this correlation? What’s the benefit in exchange for the lots-of-extra-time spent when the purpose is a ceiling fan repair in a single home? Blade speed seems to tell us a similar thing, as does “feeling the breeze created”. … If you happen to come back and read this comment, or for anyone else who knows the answer: Does altering the blades’ pitch from some very shallow pitch to some significantly steeper pitch, some pitch or angular amount that results in a significant slowing of the RPM on the low setting (say doubling the amount of time required for ten revolutions, or more), without making any other design changes, result in decreased, increased, or no change, with respect firstly to electric consumption and secondly to the motor’s winding temperature, after continuous operation for an extended time of at least several days? … My best guess is that increasing the blade’s pitch so that the RPM slows down increases heat in the motor windings. This is based upon something written by someone else whose website I’ve linked to at some point or another in this capacitor replacement project, but I probably didn’t link to the precise URL this info was located on (and who knows if it’s still there), and which I read some time back, before my original post above was written. What I remember was that turning on the power or energizing the coils, and locking the shaft so that it doesn’t turn, seems a method to artificially increase the heat of the motor. Therefore, it seems reasonable to presume that an increase in the blades pitch (or likely a lengthening of the blades) that results in a decrease or slowing of the RPM (indicates increased resistance to movement), would also increase the heat of the motor, though probably not to as great a degree of heat as when the shaft has such a great resistance to movement that it is fully stopped (or “locked”). Further, if this hypothesis of mine has any basis in reality, coupled with the long-time observations of mine in many endeavors, motor heat will probably decrease its total lifespan. Therefore, I think I’d rather decrease the blade’s pitch to a flatter angle (or keep it the same as the manufacturer set the angle), and additionally *slow the RPMs* by altering capacitor values, as a method of increasing motor longevity, in addition to decreasing turbulence, and to decrease CFM. Okay, I just checked, the ceiling fan guy’s page (search for text “Locked Rotor Temperatures” without quotes) is still there. It’s a great page, but unfortunately it didn’t answer my secondary question regarding how small changes to the capacitor values affect a ceiling fan’s operation. You are a blessing. Thank you for sharing all of your great ideas and the results of your research. Truly splendid! To everyone that has just arrived at this webpage: Please, Please PLEASE read all of Kens’ other pages before asking a question. He has done such a good job of documenting the internal workings of ceiling fans (or providing links to pages with information) that you will most likely find the answer to your dilemma on one of his pages or links. For those of you that become nervous or queasy around electricity purchasing a new ceiling fan may be the best solution rather than attempting to repair an existing model. Hi, I stumbled onto your blog by accident and it has been an interesting read. Its not commercially astute for me to identify what company I am from but I design ceiling fans, motors and controls and supervise their manufacture. I haven’t read everything in detail or analysed your calculations so I only have some general comments. First of all, be very careful of the voltage rating of the capacitors. Permanent split capacitor motors will push the voltage across the run capacitor a lot higher than the line voltage. Typically when a cap dies due to over stressing they swell and bulge as shown in your pics. Replacing a cap with higher rated voltage is OK. Never use a lower rated voltage. Second, if you increase the speed a ceiling fans runs at the working voltage across the cap will increase too. So using a larger value cap (speed increase) will also increase the voltage the cap has to operate with. Third, a lot of fan designs have almost no overhead (margin) between their rated capacitor voltage and the actual operating voltage in the fan. Caps are also graded for useful life (eg. Class C is 3000 hrs at their rate voltage). Running the cap well below its rated voltage vastly increases its life. Typically the motor run cap (the one is series with the aux winding) is sized to produce maximum torque. Increasing the value more than say 10-20% will slow the fan and cause excessive heat, buzzing and reduced efficiency. Decreasing the value will slow the fan down, but too much will stop the fan from starting to rotate when on low speed. In your picture above showing the single MD and the three single NTE capacitors, note the MD has 1 x 4uF @ 280V and the other two are 250V rated. The 280V cap will most likely be the run cap in series with the aux winding and rated accordingly. Replacing it with a lower voltage rated cap will possibly lead to premature failure of the replacement cap or a possible fire event if an incorrect type of cap is used. For most ceiling fans if you disconnect the motor-run cap you can still start the fan turning in either direction by spinning it by hand. It will have much less torque but it will rotate. The reversing switch will have no effect on its direction of rotation. There are several ways of wiring the speed control switches. The most common way will place line voltage directly across the main winding when on high speed (remember the 280V cap is the motor-run cap and not for speed control). On med speed it will pass through the larger value of the two speed setting caps. On low speed it will pass line voltage through the smaller value cap. The ‘triple’ cap is thus not 3 motor speeds, it is 2 speed control caps and a motor run cap. Reversing is done by reversing polarity on either the main or aux winding, but not both. As for blade pitch. 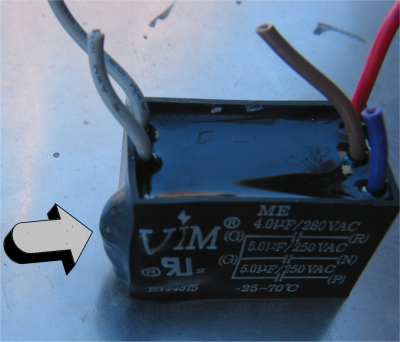 Pitch changes will affect the speed and therefore the efficiency and the working voltage across the capacitor. Changing pitch requires changing the number of turns in the motor and the run capacitor value to once again achieve optiumu efficiency. Most fan makers just tip a flat slab at an angle and spin it a circle – there is little science behind it as they just copy one another endlessly. Others (like the company I work for) spend a small fortune on innovative designs and trying to get the best performance for the least energy. We design our products in-house and manufacture in China or Taiwan but as with all things there are no perfect solutions, only best possible compromises. I have a Hunter Westwide II and installed a Lutron Maestro fan control for the fan, and a Smarthome 2486SWH6 Insteon ON/OFF switch to control the light. For the most part it works, the only thing is the fan seems to run too slowly at the highest speed setting, and from the lowest to highest speed setting does not seem to change much. From what I’ve read, I am guessing I need a run capacitor, and it seems like something in the 4.5uF to 5.0uF @ >250v seems to be the ticket. I looked at the web sites listed and found that for about $10 they can be had… however, I checked my local Frye’s Electronics store and found an NTE 4.7uF 250v capacitor for $0.89, could this really work? Why do the capacitors designed for ceiling fans have such large plastic casings? Hey, Thanks for stopping by Anonymous and sharing. I was aware of that. You are the first person to comment that they also noted it. One reason I used those NTE capacitors was that they were publicly available singly. I could not find the MD capacitors at the time, and besides Internet searches this included looking in a tome-sized electronics catalog of several thousand pages. I believe I recall finding a listing for physically-larger “motor-run capacitors” in metal cases (metal cans) of higher-voltage ratings than the NTE (some far higher than even 280V), but their capacitor-case size would not allow installation in the fan’s existing capacitor housing. So then, if I chose those, I realized a need for drywall and painting work, in order to run long wires (if possible) to a metal electrical box where the metal-housing “motor-run” capacitors could be mounted. I preferred putting them directly in the manufacturer’s case. The electronics catalog had, perhaps, hundreds of different types of capacitors of apparently different constructions and or materials, evident by names such as ceramic, tantulum, polypropelene, etc., but if it didn’t say either “ceiling fan capacitor” or “motor run capacitor”, I didn’t feel my knowledge was great enough to know which one to select, and it was important to me that the case it came in had containment features. I do believe at some point I checked the fan manufacturer’s site, but could not find any replacement capacitors listed, I seem to recall that their site, at the time, was dedicated to selling new fans and new fan models, and if they had replacement parts web-listed, that information was buried where I couldn’t find or access it. So I moved on and worked with what was available at the time. I made my compromises, as well. At some point in time, when faced with the decision to dispose of the existing fan and replace the entire unit, or to use the NTE “ceiling fan capacitors” that were available to the public, I chose the latter option. Others might choose differently, if they choose to do it at all, and I try to discourage that. My ceiling fans are still running, mostly on “low”, but two of them continuously on that speed (and I love the new lower low speeds I’ve apparently adjusted them to). Occasionally, one is turned up to medium speed for a few hours, and seldom turned up to “high”, but when on high, usually only for a few minutes. Of course, the switch design means a need to cycle momentarily through all other speeds when turning it on and off! In all these speeds, the “run” winding must be engaged, at least as I understand the schematic. Regarding the waveform angles, my thoughts are different than yours, and if I had one of these on a bench, and I was younger than I currently am, I’d probably start some testing to understand it a little better, as it’s very difficult to discern where the truth of anything lies these days, when nearly everyone is trying to sell something (but you don’t seem to be doing that). I’m still skeptical, though. It would be interesting to test whether your assertion that completely disconnecting the power to the run winding in fact results in a running fan if it’s hand started. If so, this could be the same magnetic mechanism that results in higher working voltages, or what I’m thinking of as some kind of spillover. In short, if your assertion is true (and it very well could be), then I’d also want to know why the electromagnets work that way, and that would undoubtedly require a lot more time in analysis than I’m willing to spend (on what should have been a simple capacitor replacement). I believe the manufacturer’s capacitor (three-in-one units) lasted about 8 years. I’m curious to see how long the NTEs last, I presume maybe not as long, but who knows, maybe it will be longer. They still seem to be working. I just decided to Internet search for motor-run and motor-start capacitor, and I see that there are a lot more capacitor choices now than when I wrote this post, some of which, going by the associated images and given case dimensions, would possibly work. Were I to make a similar repair today, I would probably have better options than back when I did the last repair and wrote the original post. It seems that some of the capacitors listed under “motor run” types claim to be of polypropylene construction. Keep in mind this is only my guess: I figured that the plastic casing, with what looks like filled epoxy, served at least two purposes: insulation and containment. I honestly don’t know if a capacitor can be kept cooler by not insulating it (they seem to get hot before they blow), or by heat sinking it (ignoring momentarily the need to isolate each plate’s energy from a ground or conductive point to avoid a short), but containment seems like a reasonable safety feature. If containment is one of the reasons that “ceiling fan capacitors” are encased the way they are, then a “motor-run capacitor” may or may not have equivalent containment-safety features. 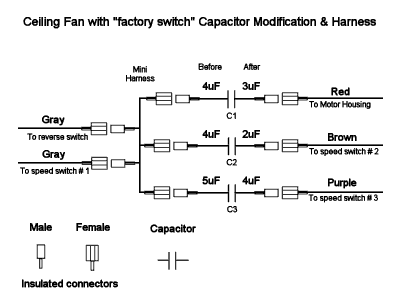 Multi-capacitor, multi-speed ceiling fan motors with capacitor/winding wiring diagrams. I have a large 20″ Lakewood floor fan. At low settings (three speed) it has(had) quite a lot of air movement. At times it seemed to much. So without thinking about the electronics involved I hooked up a dimmer switch to it. The fan began turning very slowly and the motor heated up quickly. I turned it off. Waited a while and tried it again. Nothing. Lakewood has filed Chapter 7, and no phone or website is available to them to get assistance. Questions: Did this blow the capacitor or is the motor shot? The capacitor does not look melted or deformed. Neither do the motor wires. The capacitor is C51 8 microfarad +/- 5%, Max 70 deg C. I’d like to try to replace the capacitor to see if this corrects /fixes it. IF not any other suggestions. Also where could I obtain a like capacitor. If I want to slow this thing down a bit, what would be a good capacitor to try. Thanks. “Did this blow the capacitor or is the motor shot?” I don’t know. You mentioned the motor got hot, that indicates an issue. Whether the heat resulted in the motor windings breaking down, tripping a safety fuse of some kind, or something else is hard for me to guess. A floor fan is probably somewhat to quite a bit different than a typical ceiling fan, and I believe I mentioned above that I’m not an engineer. My ceiling fan “motor” is powered by AC, but is the floor fan “motor” you have powered by AC or DC is a question you need to ask yourself. If it’s a DC motor, but the unit plugs into an AC wall outlet, then the circuitry between the plug-in-the-wall cord and the motor itself is going to be quite a bit different. I think you have a tracing problem, in other words, find out if and where in the circuitry the power is interrupted, you probably can solve the problem. There are capacitor testers. If there’s power at the motor itself, there are resistance tests (measured in ohms) that can be performed on some types of motor windings using a tool such as what used to be called a VOM or Volt-Ohm-Meter to insure the very-thin and nearly-transparent insulation between the wires hasn’t broken down (possibly as a result of too much heat) and shorted. In all of these cases, it’s easiest if you have a schematic to go from, and it sounds like you don’t have one (a common problem). A top-of-the-line tool is an oscilloscope, this allows you to look at the shape of an electric waveform. You can buy some types of capacitors at some electronic supply shops. As far as what I found for ceiling fans, my prior post has a list of a few of those suppliers. You could try using a search engine, which is how I found those that I listed. I have a Hunter Mod #20656 013811, Cat #00100 and can’t get help nor parts. This is a remote controled unit with the Remote circuit board not only SHOT but unreadable. 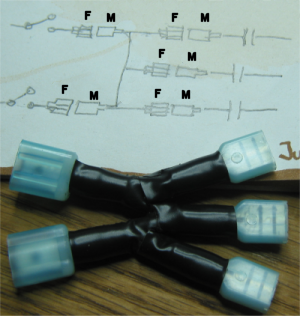 Leads from Motor windings (7 leads)terminate into a 9 pen plug. Colors are Red, Black, Yellow, White, Pink, Gray, and a small Black that appears to be around an 18 or 20 Gauge stranded.I am looking for the lead hook-up and capacitor assignment to make it a conventional (switch Controled) hook-up. I really don’t care if I have anything but High speed as I want to conrol it with a wall potentiometer. Do you have a reference to such or direction to where I might find the info (Hunter is no help), or just a wild guess? Anything would be greatly appreciated. your wiring diagram of a double pole double throw switch was very accurate and useful. Thanks so much. I am 13 and am working on a lab write up for circuits. IN this we had to build and wire our own toy/invention and we used a dpdt switch. IT is very hard to explain so your diagram will help me greatly. Thanks again. I had problems with capacitors not lasting and expensive to replace. Nowdays I run two wires through centre piping and mount microwave oven capacitors on top of motor either series or paralel depending on what values you need. Microwave caps are more or less [2000 working voltage] and therefore outlasts the motor. It does look a bit awkward when you know they are mounted there, but hey, who looks up to your ceiling fan. I am very appreciative of the wealth of infomation researched and provided by the CJ. So, it is only to assist CJ in it’s effort to improve this page that I offer this observation. When my ceilng fan went out, my fist suspicion was the 3-speed switch, but after dismounting the light kit it was obvious the the capacitor was blown (thanks for your photos). Now my only interest is finding a replacement capacitor (not really how one works) and from where. So, the reason I got to this site was the hope of finding a supplier as well as how to install it. Just the same, thanks again CJ for this valuable information. Gotta find a capacitor now! First link in the article, a link to the prior article, that article has a few suppliers listed. Hello Ken been reading ur article. makes me motivated to repair my own ceiling fan rather that call a technician to do it. It cost me up to 100 singapore dollars just to replace 3 capacitors. but now i have a problem, how do u connect the wires to a capacitor even the capacitor does not have its own wire? The capacitor i just bought has this metal edge protruding out. What do you suggest? A crocodile clip? or is there any better ways to connect? PLs advised. Thanks. Sounds like a lot of work for a ceiling fan but I guess if you have the know how. I have read through all of your interesting data….and I do understand it a little. Maybe you can help me with the problem I am having with my elderly parent’s ceiling fan. I would appreciate any help…and detailed explanations on how to fix it. Here is the problem: The reverse switch (black switch on the fan that is either pushed up or down), was evidentally jarred loose or something and it would work its way into the neutral or middle position. When it did this, the fan would cut off. A friend of my parents had the bright idea of taking out the screws, exposing the part where the wires are…and when they did, the reverse switch broke to pieces. I wasn’t there when this happened, but this person put everything back (except the broken switch) and now the fan doesn’t work. The lights on the fan work fine, but the fan itself will not turn. My questions: Is there a way to bypass the reverse switch wires so that the fan will work again? If so, can someone give me a detailed explanation of what wires need to be disconnected or cut, and where and if they need to be spliced to other wires in the fan? I am very good at following instructions, and am savvy about turning off electricity at the electrical box, etc. Any help is appreciated! If I need to take pictures of the wiring and post it here, I can do that as well. Hi Laurie, my fan used a DPDT reverse switch, and yours may or may not be the same. You can probably obtain an exact replacement switch from a ceiling fan store, although a basic DPDT switch of an appropriate current rating can probably also be obtained at either an electronics supply or perhaps even a good hardware store. An appropriate current rating would be at least the same rating of the broken reverse switch, or better. If it was my fan, I’d just replace the switch, and made sure I wired it the same way the old one was wired. If I didn’t mind the fan running in one direction only, either blowing up or down, then I could bypass the switch by hardwiring it. The only way to reverse the fan direction would then be to rewire the bypass once again. 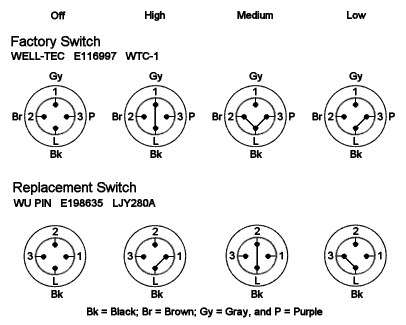 One of my comments above has some links to several DPDT switch schematics, which, coupled with an examination of a disassembled switch to understand how the contacts slide, should help you. Several other folks also made relevant comments. One of the problems with these fans appears to be getting your hands on an accurate schematic. The several schematics I found, each of which is somewhat different, may or may not be accurate for your fan, that is something that only you can judge. So, there’s a certain amount of guesswork involved, short of tracing each wire on a bench and drawing your own schematic. There’s the additional difficulty that the schematics are idealized or simplified versus how the wires and parts appear in the fan itself. Because of that, I could not give you precise instructions. Wire colors may be different, etc. Additionally, there are the unknowns regarding what your parents’ friend did when she or he put it back together without the switch. If s/he didn’t try to bypass the switch, then that would be why the fan doesn’t work, as the electrical current going to one set of motor coils flows through it. You noted this when you wrote, “it would work its way into the neutral or middle position. When it did this, the fan would cut off.” However, if your parents’ friend did try to bypass it, then perhaps he or she miswired it, and the question arises of whether any damage was done as a result of turning on the power. Presumably this creates a problem for you, as you may no longer know what wire went on which terminal of the old reverse switch. If you study the wiring diagrams and the reverse switch diagrams over the course of several days, with sleep cycles in between, you can probably devise some method of back-tracing the wires and finding their correct positions on a replaced reverse switch. On the other hand, if you study the fan and switch schematics for a few days, and just feel lost and not sure what to do, it’s probably best to entrust the work to someone more familiar with such repairs. Thanks so much Ken for publishing this incredible research. My new fan quit working on hi speed (ran the same speed as med) after a city wide power failure. I have a 5 wire capacitor in the fan just like the one you had. Thanks to your research and instruction I determined that the capacitor between the gray and red wire was faulty. So I just added a 2-wire capacitor between gray and red wire, left the 5-wire intact, cut and capped the red lead out of the 5-wire one and it works perfectly. Thanks again for this really great post. Thanks Bob! I’m glad it helped you. Little of what I did above would have been possible without Ray Franco’s generous work on the schematics, whose website I’ve linked to numerous times above. Thus, I in turn must give him thanks! does anyone know where to purchase two capacitors for a ceiling fan? Are you kidding? For someone unschooled in electronics,you are doing pretty good. I am trained in electronics and your examination and presentation blew me away! Your material can not be too far from engineering grade in terms of thoroughness. No, I wasn’t kidding, I meant that statement (wrote it a long time ago, barely remember it) of no training in a formal, academic sense. Thank you for lifting my spirits, Bleach! I need help to ‘re-wire’ a ceiling fan. Fan is down from ceiling, all wires are disconnected. Please help and/or advise me where to find wiring diagram.